Last year, I wrote a post entitled "Eco-Friendly Gardens are No Sweat". In it, I mentioned how many of the actions that make a garden eco-friendly, such as incorporating native plants or using mulch to conserve water, also end up requiring less work. This means that when others are out dragging around hoses to keep their landscape alive, we can be relaxing in our hammocks, deciding what we want to plant next. I recently saw an article on Consumer Reports .org entitled The Slackers Guide to Lawn Care which goes a step further. Not only does it list many of the same eco-friendly items that I had in my "No Sweat" post, but it also lists how many hours you can save, annually, by adopting these "green" landscaping practices. Save up to 12 hours annually by letting the lawn go brown during dry spells - Water Efficiently – The amount of water that your lawn needs will depend on the grass species and weather conditions. But remember, overwatering can often do more damage than under watering, to both the grass itself and to the local environment. In general, applying one inch of water per week is the recommendation when there is insufficient rainfall during the spring and summer.The best rule is to water only when the lawn begins to wilt from dryness –– when the color dulls and compressed footprints stay visible when you walk across your grass. Save up to 8 hours annually by fertilizing less frequently - Fertilize in the Fall for a Healthy Lawn and Community - Before you fertilize, test your soil to learn what, if anything, it needs. 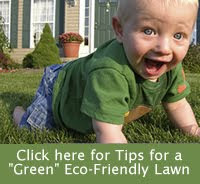 Applying too much fertilizer can damage the lawn and is a major source of water pollution. 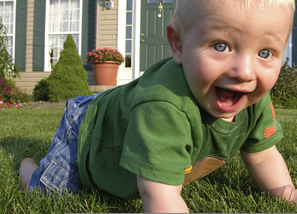 Contrary to popular practice, spring is not the time to fertilize your lawn. Fertilizing in the spring forces energy into the blades rather than the developing roots. This can lead to disease and insect problems later in the season. It will also require more frequent mowing. Fall is the best time to fertilize, when the roots that will sustain the plants through the following summer are actively growing. Slow-acting, organic fertilizer products are available which are kinder to your landscape and to the surrounding environment. Save up to 10 hours annually by mowing less often - Follow the “1/3rd rule” of mowing – Lawn experts recommend that you shouldn’t remove more than 1/3rd of the leaf blade when you mow. Removing too much of the foliage while mowing shocks the grass, forcing it to redirect its food resources from roots and stems towards new leaves. That means that if you want to mow to a 3” height, you shouldn’t mow until your grass is 4.5” high. Save up to 5 hours annually by learning to live with certain pests and weeds - . Practice Integrated Pest management – One of the first rules of eco-friendly gardening is, not all insects are bad. If you see insects in your lawn, take them to one of the local extension service offices for proper identification. Then, always select the least harmful form of insect control. Here is a list of IPM Specialists from the University of Maryland Extension. Save up to 15 hours annually by leaving your grass clippings on the lawn rather than bagging - Mulch lawn clippings for a healthy lawn – When you mow your grass, leave the grass clippings where they lay. Grass clippings provide free, natural nutrients for your lawn, reducing the need for supplemental fertilizers or the labor intensive chore of bagging and removing lawn waste. Many mowers are outfitted with mulching attachments that chop clippings into fine pieces for quick breakdown. But if you follow the 1/3rd rule, you should never produce enough clippings to cause problems with your lawn. Save up to 15 hours annually by choosing a low maintenance grass variety - Get to know your grass – As with everything in your landscape, it’s best to get to know as much as you can about the species that you are dealing with so that you can make the right choices in taking care of it. Whether you already have an established lawn or are putting in a new one, get to know your grass. Here’s a great document from the Virginia Cooperative Extension about Selecting Turfgrass.